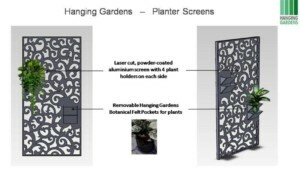 Screen Gardens combine laser cut screen panels with light weight, soil based garden pockets in a self contained, powder-coated aluminium, vertical garden module. The modules come with a waterproofed backing panel, a drip tray and automatic irrigation. 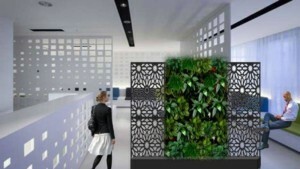 They are ideal for interior and exterior application as space dividers. The gardens can be double sided or single sided. 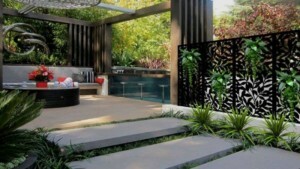 Screen gardens are ideal for exterior use where a semi-planted wall is required. These gardens can be used as fixed or movable, double sided or single sided space dividers. Where fixtures are permitted, these can also be wall mounted. 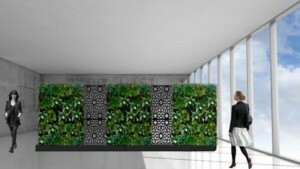 Ideal for interiors where planting is combined with decorative panels. The screens can be laser cut to any design. 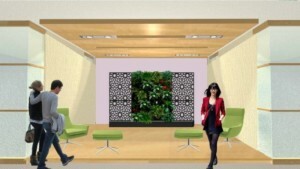 The modules can be used as movable, free standing, double sided or single sided space dividers. They can also be wall mounted. The system is comprised of a powder-coated aluminium module with UV resistant, pocket gardens as a medium for holding plants. The plants are planted into the unique, removable felt pockets in soil. The plants, in their felt pockets, are placed into the outer Hanging Garden pockets. 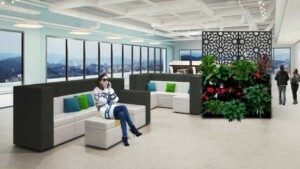 The Hanging Gardens are suspended on 316 marine grade, stainless steel rods secured to the aluminium frame. 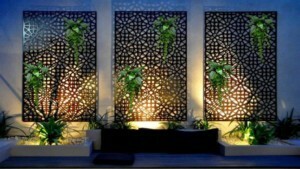 The screen is a powder-coated aluminium and the outer material of gardens is guaranteed in harsh UV light for 15 years. Our Screen Gardens can be made to fit almost any size and the configuration is tailored to fit the design requirements. Weight / m2 : Approximately 35 kg per m2 when planted with standard potting mix and saturated. The light weight Planter Gardens are delivered to site without plants and are quick and easy to install. All plants are delivered to site, pre-planted in their felt pockets. Installation of the plants is in accordance with a Planting Plan. Automatic irrigation is pre-assembled and requires a standard connection to a mains water supply. Site measurement is generally undertaken prior to manufacture. 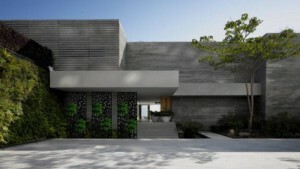 Any wall penetration and fixing detail is designed according to substrate, building design and engineering requirements. Exterior plants for North, South, East or West facing sites as well as for high wind, coastal environments. All plants are pre-planted into their felt pockets and delivered to site ready to be placed into the Hanging Gardens. The irrigation systems are designed for the site and environment and can be connected to a rainwater collection system and/or main supply. Drip feeding is water conserving and delivers low operating costs, easy maintenance and water management benefits.